How can we engage each other, especially those who are different from us, and know how one another thinks, if we don’t personally get to know each other? True, we can read about each other, but will what we read be truth, or opinion? In the past I have had a tendency to read or view what was suggested by those who were already leaning in the direction I was. For example, my friends who are more right-leaning than I am will suggest I watch Fox News over CNN. They will suggest I read World magazine rather than Time magazine. In those scenarios, played out on both the right and the left, often people subtly, or not so subtly, move in a certain set direction and they form stronger, more polarizing opinions of those on the other side, but do they really know them? Do they understand why they hold the views that they do? In the last few years, I have become friends, and have made many acquaintances, with people across the spectrums of perspectives and understandings about life (next week meeting up with a friend who is atheist, and an acquaintance who seems to be deconverting; ha ve had dinner with Free thinker and atheist Dale Hemming who sponsors the notorious billboards in Sioux Falls about atheism, child abuse, domestic abuse, evolution, and others), and lifestyles (On a few occasions I visited with, though now have lost track of, an African Muslim gay man in Sioux Falls. How interesting that the name “Jesus” instantly brought him emotional, warm tears. ), as well as with those of various faiths. It has usually been a delight to learn about different perspectives. I often find that people different from me are actually much nicer than I ever gave credit to. 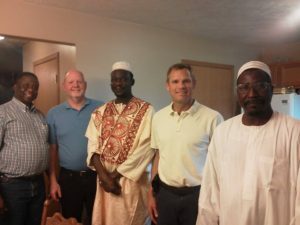 To my amazement–I know, I’ve been naive and sheltered–I have found my Muslim friends, many of whom I have met at John Morrell / Smithfield Foods where I am a part-time chaplain, to be interested in conversation, including spiritual conversation. Some of them are interested in dialogue and they are quite open-minded. Others are more orthodox in their Islamic faith, even evangelistic in their way. However those people, too, have been kind to me, and genuinely interested in sharing about their practices. And, as I have found with most immigrant and refugee people I meet, they are courteous and hospitable people, which is refreshing. It has USUALLY been a delight. Sometimes on-line dialogue and debate is not pleasant–probably due to its anonymous nature, though it’s often educational. Sometimes in those cases, I have been able to meet in person with them to find out that, hey, they are people just like me, with emotions and feelings, and typically they care just like I care, just coming from a different angle or perspective. And I admit, at times with a defensive tone, I have given a rough rub back, not helping the communication. I promise with this blog to sincerely seek to always be respectful and gracious in my communications, whether it be through Facebook comments or in my posts. Good morning Fred, I agree with your angle. By talking with those individuals who have a different perspective or belief you are ably to understand why someone could think the way they do. You can then be a powerful witness to them in your own life as someone who is not judgemental and can attract them to Christ. Keep up the good work my friend and let God, not man direct your ways! Love ya Fred! Thanks for your encouragement, Brian!